Figure A48. Kamchatka-Kuriles anomaly, interpreted as the Kamchatka-Kuriles slab, with (horizontal) [vertical] cross sections through (A)[D] the UUP07 p-wave) and (B)[D] the combined SL2013 and S40RTS s-wave models at 470 km; C) the location of the modern geological record that we interpret to have formed during the subduction of the slab. The Kamchatka-Kuriles anomaly (Figure A48) is located below the Sea of Okhotsk and is interpreted to represent a slab that is still subducting at the Kamchatka-Kuriles subduction zone, penetrating down to the upper part of the lower mantle. 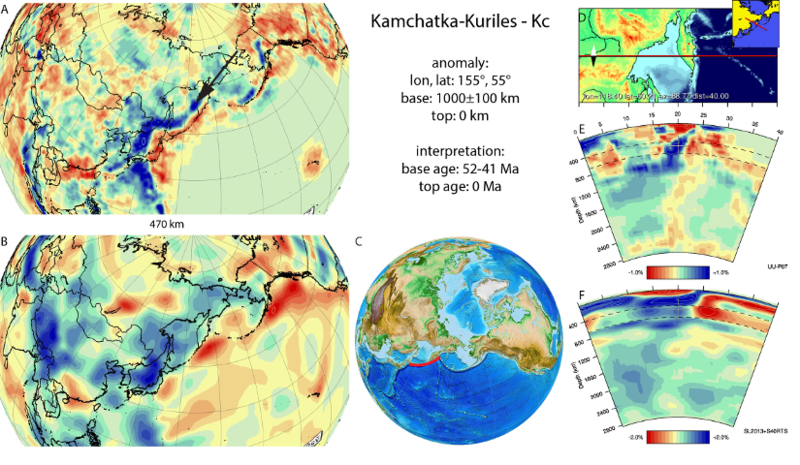 We previously named it the Kamchatka slab (van der Meer et al., 2010) but renamed it to include the widely used Kuriles slab (Spakman et al., 1989; Van der Hilst et al., 1991; Gorbatov et al., 2000; Jiang et al., 2009; Koulakov et al., 2011). It represents northwestward-subducted Pacific oceanic lithosphere. The part of the slab below 660 km discontinuity was interpreted to have an age of at least 65-55 Ma (Gorbatov et al., 2000). Nokleberg et al. (2000) and Golonka et al. (2003) proposed that the onset of westward subduction below Kamchatka started earlier and formed the Olyutorka arc since the middle to Late Cretaceous. Van der Meer et al., 2010) followed that latter interpretation. Following the more recent tectonic models of Konstantinovskaia (2001), Hourigan et al. (2009), and Shapiro and Solov’ev (2009), accretion of the intra-oceanic Aichayam-Valangskyi ophiolite terrane including the Olyutosky arc to the Asian continental margin followed upon a phase of SW-ward subduction that ended around 52 Ma (Konstantinovskaia, 2001; Hourigan et al., 2009), which we correlate to the Agattu slab. This was followed by a subduction polarity reversal and onset of NW-ward subduction of Pacific lithosphere during the Middle Eocene (Konstantinovskaia, 2001; Shapiro and Solov’ev, 2009), simultaneously with the Aleutian slab to the northeast, which we interpret to as the age of the base of the Kamchatka-Kuriles slab.